As seen in the Press Democrat! Schnitzel holds a very special place in my heart (and stomach). My Grandmother used to make it often and she was the master of schnitzels of all kinds. It was such a favorite that used to call me her “little schnitzel” which I think (I hope) talked to how special this preparation (and of course me) was. If you like fried chicken, schnitzel is for you. 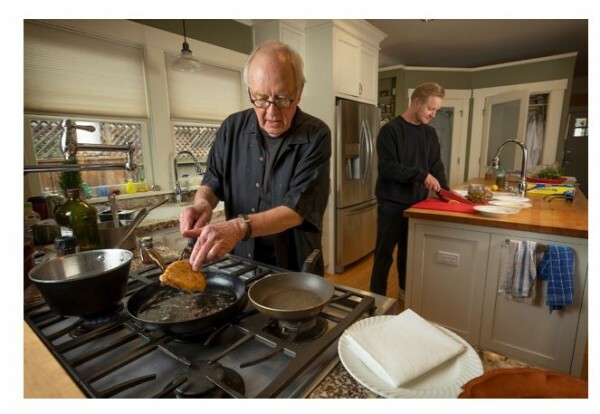 Photo of Chef John Ask and his son, Tyler, cooking Schnitzel in the Ash family kitchen! Photo credit: John Burgess of the Press Democrat. Schnitzel is a German-Austrian term which translates roughly to “slice” or “shave” according to the Oxford Dictionary. It’s described as a slice or “scallop” of veal or other light meat that is pounded then dusted with flour, egg and bread crumbs and fried. Not a particularly evocative description but most would agree it’s damned delicious and easy to do. • Weiner-Schnitzel usually made with veal. The “Weiner” designation refers to its supposed origin in Vienna in Austria (tho’ there is some dispute about this). • meat is gently pounded between sheets of plastic wrap. This is done to achieve an even thickness (usually 1/4 inch or so) for even cooking and to tenderize the meat. Use the flat side of your meat pounder to avoid tearing. If you don’t have a meat pounder, a rolling pin or even a heavy bottomed sauce pan works just fine. > Get the full story and all recipes with photos on this PDF!